You are browsing the Blog for Ethnicity Archives - Marja-Leena Rathje. A groundbreaking genetic study led by a team of U.S. and Canadian anthropologists has traced a direct DNA link between the 5,500-year-old remains of an aboriginal woman found on a British Columbia island, a second set of ancient female bones from a nearby 2,500-year-old site and — most stunningly — a living Tsimshian woman from the Metlakatla First Nation, located close to both of the prehistoric burials along B.C.’s North Coast near the city of Prince Rupert. The findings are the first of their kind to be generated using powerful new techniques to analyze the complete mitochondrial genome of the individuals studied, reconstructing a millennia-spanning line of maternal descent and providing remarkable new evidence of a people’s enduring occupation of a specific geographical area. The scientific achievement is also seen to have significant implications for First Nations’ land claims and treaty rights, giving aboriginal groups a powerful new tool for demonstrating deep-rooted links between the present and hyper-distant past. Read more in the Vancouver Sun. If unable to view as a non-subscriber, try the original source here. I had first seen this referenced in Archaeology.org which has a link to what may be the original article. To me, this is exciting and fascinating news. Imagine some day having this new DNA research technology available to anyone to find one’s own roots from thousands of years ago. I wonder where my maternal ancestors came from? This was accompanied by another article called Silenced Voices**, how a huge number of languages are dying along with the remaining few elders who still speak them. So, in light of the first article, is this not a very a good reason, amongst others, to provide the internet and related technology at a low cost to still-deprived isolated communities such as many of Canada’s First Nations and Inuit people to assist the younger generation in practicing their native languages in a lively manner? Language loss is surprisingly quick without usage, even for me since I rarely get to speak Finnish since my parents passed away two decades ago. The internet and reading Finnish blogs and news is preventing complete loss, and keeping me in tune with my original culture. Language and culture go hand in hand, or should it be, hand in glove. For interested readers, more related links can be found under the linguistics theme. I would be happy to hear what experiences you, dear readers, have had with language loss, personally or in others you know. Also, a bit about the photos here… how very timely for me to have suitably related images literally come up while reading and writing about this. 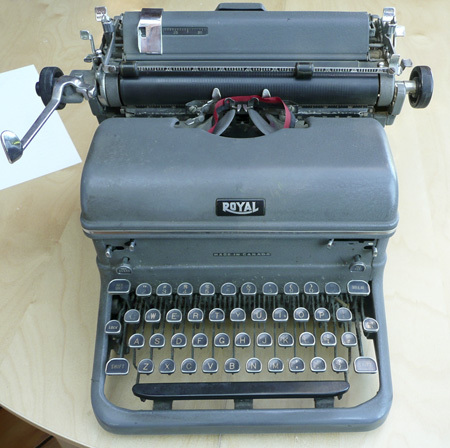 This ancient typewriter, now old technology within just a generation, was retrieved out of the storage dungeon, erm, crawl space for our ten-year-old granddaughter who is eager to try it out. It needs a cleaning and new ribbon which I believe are still available in some shop in Vancouver. P.S. This was probably made sometime in 1930’s, says husband. 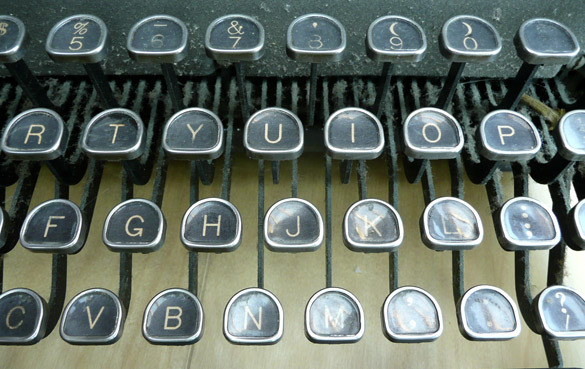 I also learned that the typewriter was invented in 1870 – so that is well over over a hundred years of steady use. A little off topic, yet interesting. ** UPDATE 15Dec2013 – links have expired already! I really must stop linking to the Vancouver Sun’s articles which are not kept active for very long! … the summer solstice, (or properly June solstice for it’s winter in the southern hemisphere). Memories of magical midsummer nights in Finland, Denmark and Sweden made me long for those white nights of the north, and to feel again that amazement with how joyful and energetic the people were. Celebrations rooted in pagan times abounded. It seemed like no one slept much, just soaking in the light, as if refueling after the long dark winter. How could you sleep when the sun hit your eyes where you lay in bed, with only sheer window coverings?, I thought the first time I visited as a teenager, grumpy from jet lag. This is the time that most Finns start their summer holidays, their trips to summer cabins by serene lakes, leaving the cities behind. Businesses reduce to minimum, it’s as if the whole country slows down. How come here in Canada, a northern nation, we don’t celebrate midsummer night? Oh, the Scandinavians communities have their events in various cities this weekend, but is that all there is? Where is the magic? Even up in northern British Columbia where we lived a few years, there was no celebration, no sense of the ancient rituals of the seasons. For the first time in some years, yesterday afternoon husband, youngest daughter and I went to the Scandinavian Midsummer Festival at our Scandinavian Community Centre to see if we could find a little of that magic I always miss. We were very pleasantly surprised how the event had grown and how well attended it was. I loved the choir, the folk dancers, and the variety of colourful and beautifully made national costumes they wore as did the many volunteers and quite a few visitors. (How I wish my mother’s fit me.) We enjoyed samples of food and displays set up by each Nordic country celebrating their heritage and crafts. The Viking Village was definitely the most impressive, put together with a lot of hard work by the Norwegian and Icelandic members. 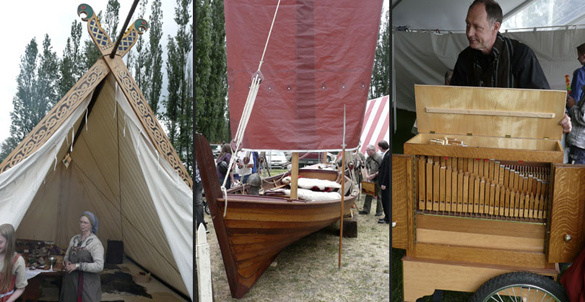 The village held a couple of boats, one just recently completed and made by hand, interesting tents with carved and detailed wood frames, upright looms in the prehistoric style, shields, helmets and weapons, and characters in Viking era costumes and jewelry enacting scenes of village life. Other highlights for us were the Finnish birch bark woven crafts and wood objects, plus the Dane Steen Larsen and his reproduction of an 1830 European barrel 72 pipe organ that he built and which plays six different melodies. So it was that a little of that nostalgia and pride for the traditions of the old country was nourished and satisfied in me. All of us people there celebrated midsummer in an emigrant-Nordic way far way from our roots. If you live in the Vancouver area and you are interested, the fest is still on today and is open to everyone. Finnish was my first language. I was five years old when my family emigrated to Canada. Arriving in Winnipeg, I was promptly placed in school, not knowing a word of English. Now that was language immersion! I don’t remember much of those early scary days. I was already reading Finnish and we continued to speak Finnish at home. I learned English quickly enough as children do, but my parents’ English was never perfect. LIke many working class immigrants, they were too busy working hard to survive to take more than a couple of basic language classes. Some immigrant parents, wishing to learn English through their children, did not allow their native languages to be spoken so some of my friends lost most of their mother tongue. I’m sure this was typical of many immigrant experiences in North America and other parts. These days, I’m sad that my Finnish is not a strong as English from lack of everyday practice since my parents are no longer with us. Perhaps because of that, I’ve developed strong feelings about language being part of a person’s identity and connection with his or her roots and culture. So whenever I read about how many languages are dying around the world, I feel sorrow at the world’s loss of so many cultures. Indigenous languages are dying off at an alarming rate in British Columbia, prompting linguists to include the province on a list of the five worst global “hot spots” for language extinction. Most fluent aboriginal speakers are aged 60 or older, and their languages will be lost forever when the last speaker dies, said David Harrison, co-director of the Enduring Voices project, which seeks to document and revitalize languages slipping towards oblivion. Much of the blame for language loss can be tied to residential schools, UBC linguistics Prof. Suzanne Gessner said. For decades, children were taken away from their families during the school year and educated in English. A compensation package designed to address the wrongs of residential schools did nothing to revitalize languages, she said — and last November, the federal government cut $160 million in funding for aboriginal languages. I’ve recently come across some great links on a couple of interesting subjects – the first an important environmental story and the second a fascinating linguistic and ethnological one. 1. At Biodynamic Farming and Gardening I found out about a film called How to Save the World – One Man, One Cow, One Planet. View the short video excerpt about how India’s marginal farmers are saving their poisoned land by reviving biodynamics, an arcane form of agriculture, based on the teachings of an elderly New Zealander many are calling the new Gandhi. If you are anywhere near Hamilton, Ontario, Canada, you may be interested in this upcoming exhibition at the Art Gallery of Hamilton. I wish I could see it because, as some readers know, I’m interested in the northern indigenous cultures. I do wish they had an online gallery for those of us who can’t get there. “This exhibition presents a selection of work by Canadian Inuit artists and Sami artists from Norway, Sweden and Finland made between 2000 and 2005. Although there is no evidence that the Sami and Inuit are in any way related, they are both indigenous cultures who originally inhabited the lands now incorporated into the confines of contemporary nations. Their circumstances in the years since contact have many similarities as far as the affects on religion, language, lifestyle, learning and politics, with the exception that Sami European contact was earlier and more intense. Both cultures have a long history of making specially crafted objects for functional and religious use; the contemporary manifestations of this tradition show varying degrees of connection with previous times as well as clear indications of change. Artworks from both cultures are displayed side by side in this exhibition and their juxtaposition invites comparison in such characteristics as continuing connection to the original culture, size, media, content and reference to the past. Thanks to Árran Blog for this information. Árran Blog presents news and announcements of interest to the Sami people living in North America, with many fascinating links. ADDENDUM Jan.11.06 – Thank you to Steve Denyes, Communications Manager for the Art Gallery of Hamilton for writing in the comments! He kindly points out that there are some images from the exhibition on view on their website – just follow his suggested links or try this link. Shown are works by several Inuit artists and one by a Sami artist. As my dear readers know, I’m fascinated by the northern indigenous cultures, in particular the Saami people of northern Europe who are a branch of the Finno-Ugric family. Some time ago I came across a Finnish photography website Leuku.fi that includes a book by Pekka Antikainen: Saamenmaa or Land of the Saame. It is viewable as a PDF (7.9 MB). It’s full of gorgeous yet honest photographs and stories of the land and the people, with text in both Finnish and English. that I made my first photographical expedition to Lapland. then that it would take me a whole twenty years to complete. I highly recommend a read and look for an understanding and appreciation for this unique part of the world through the eyes of this empathetic observer. “Today marks the inauguration of a new website on Peaceful Societies: Alternatives to Violence and War. This is truly a ground-breaking site. There is nothing else like it on the web. Granted, I’m a bit biased. The site is largely the work of my father, Bruce D. Bonta, a retired academic librarian and peace scholar whose Peaceful Peoples: An Annotated Bibliography (Scarecrow, 1993) was similarly a pioneering effort.[..] The heart of the website is the Encyclopedia of Peaceful Societies, with twenty-five entries up and more on the way. I want to spend the next three days highlighting brief selections from these entries – things that struck my fancy for one reason or another”. Fascinating, thought-provoking and recommended reading – it will keep me occupied for a while! There is a huge amount of fascinating information in the magazine and online. I’m surprised, for example, to learn that: ‘At least 30,000 people of Sami ancestry live in North America. Some are the descendants of Sami people who emigrated to the United States and Canada as Norwegians, Swedes, and Finns and some are the descendants of “Lapp” herders from the Alaska Reindeer Project who introduced reindeer husbandry to the Inupiaq and Yup’ik peoples’. These latter people are featured in a travelling exhibit The Sami Reindeer People of Alaska. I’m going to see this when it comes to Seattle next year. Faith Fjeld is the founding editor and publisher based in Anchorage, Alaska, and has done an incredible and invaluable job in promoting the Sami cultural revival with this beautiful biannual publication begun in 1991 and now in its 25th issue. 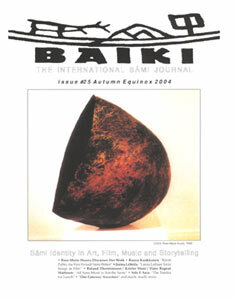 The current issue’s theme is “Sami Identity in Art, Film, Music and Storytelling” with examples of works by many ami artists. I’m excited by the wonderful abundance of inspiring material that has opened up for me. As regular readers may know, I have been slowly learning and writing about the Sami or Saami (incorrectly called Lapps or Laplanders) branch of the Finno-Ugric family, the Indigenous People of the Nordic and Northeast Russian Arctic regions called Sapmi (incorrectly called Lapland). I’ve written about their siida and the Skabmagovat film festival (one is being planned in Alaska in 2005), and about some of their music and their sacred stones or seidas. This is very interesting – ” Sámi singer releases CD in waning language”- from Helsingin Sanomat. Here are some excerpts, but do read the whole fascinating article. Palgah, a new CD by Inari Sámi singer Aune Kuuva, contains what is perhaps the rarest music in the world. She has composed the songs and written the lyrics in the language of the Inari Sámi people in the eastern part of Finnish Lapland. It is apparently the only recording in a language that is teetering on the brink of extinction. The musical traditions of the Sámi (Lapp) people in the Inari region are also in danger of disappearing. Aune is an Inari Sámi, one of the fewer than 1,000 who are left. They are a minority among the Sámi minority, and they live along the shores of Lake Inari and in Nellim, near the Russian border. With local people leaving their villages and getting dispersed around the world, the number of people speaking the Inari variant of the Sámi language has declined to about 300. 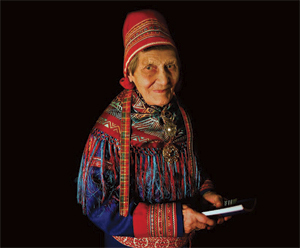 Kuuva’s CD does not have any of the traditional Sámi “joiks”. “We are not joik people”. 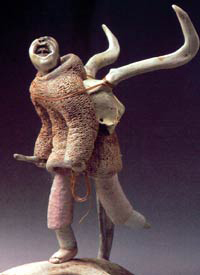 Kuuva says that the Inari Sámi are natural singers and storytellers. The melody is important for them. The recording was sponsored, and it is being sold by the Association for the Inari Sámi language. I emailed Helsingin Sanomat and they have provided me with the email address of a contact person, from whom one can order the CD. Email me if you are interested. More about the Sámi in this earlier post, in Wikipedia, and about”joiks”. Update Dec.27.04: I ordered this CD for ourselves as a Christmas gift and I’m pleased to write that we enjoy it very much!